We’re living in the era of the “gig economy.” Today more people than ever — over 30% of the U.S. workforce — work as independent contractors, temporary workers, consultants, and freelancers, and that number is only expected to grow. As an IT staffing firm, we’ve seen firsthand the ways in which both workers and businesses benefit from the flexibility that contract work provides. But it’s not without its complications. One area that often causes confusion is how employees are classified. Why Is Employee Classification So Important? 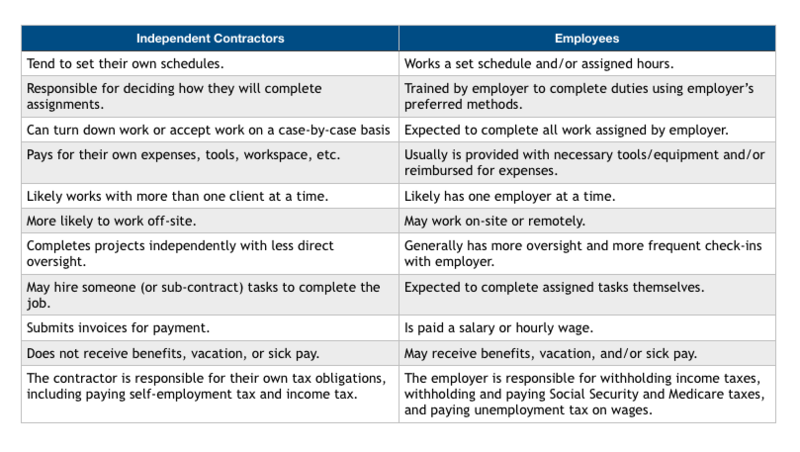 Generally, contractors are classified in one of two ways, as a W-2 employee or as an independent contractor, on a 1099 basis. Some employers prefer to use 1099 workers because they believe it’s advantageous from a financial perspective. And in fact, as many as 20% of employers have actually misclassified employees as contractors. That misclassification can have serious consequences, for the employee, the staffing firm, and the employer. Tech companies like Microsoft, and more recently, Uber, have both faced lawsuits over potential misclassification of workers. That’s not to say that 1099s don’t have their place, and many IT staffing firms do use both. But it’s important for both workers and employers to understand the difference and ensure that the correct designation is being used. What Is a W-2 Employee? A W-2 Employee is an employee of a company who is paid wages. W-2 refers to Form W-2, which is an Internal Revenue tax form. Employers are required to provide the IRS with a W-2 statement at the end of each year. W-2 employment status working for an IT staffing firm means that you are an employee of the IT staffing firm. The staffing company must adhere to all employment laws that protect employees and must contribute employer taxes, such as your Social Security match and other payroll taxes. Independent contractors actually fall into two different categories: 1099/Corp to Corp or 1099 on Social Security number. This is confusing because while both of these types receive 1099s, there is an important difference between the two, as you’ll see below. As an independent contractor, your employer does not contribute to your payroll taxes and you are generally not protected by employment laws. However, as we discussed above, there are many complications and exceptions, including the risk that you could be re-classified by the government as an employee. While both 1099 and Corp to Corp are possible, Corp to Corp is the only one that should be used by a reputable IT staffing company. Corp to Corp vs. 1099: What’s The Difference? Imagine you have your own small one-person shop consulting company. You help multiple different clients over a long period of time. You have a business set up, Federal Employer Identification Number (EIN), business licenses, a website, contracts, insurance, financial statements, etc. Sometimes IT staffing companies will have a specialized need for a consultant who has a consulting company that is capable of providing the services that the end client needs. In this arrangement, reputable IT staffing companies will do due diligence to ensure the individual does have a business of their own, checking into business structure such as articles of incorporation, proof of multiple clients, proof of business insurance, etc. The IT staffing firm is subcontracting to an established firm and they are paying them on the EIN number, not the Social Security number. This is an entirely different arrangement from a worker that is paid as a 1099 contractor to their Social Security number. While it’s technically possible for a company to use this arrangement, reputable IT staffing companies will avoid it, due to the legal and risk liabilities that this raises for both the staffing firm and the end client of the services. Paying a worker on a 1099 basis to their Social Security number is a huge red flag for government agencies that this person is highly likely to be misclassified as an independent contractor vs. being considered an employee. IT staffing companies generally hire contract technology professionals as W-2 employees. They are hiring the person, paying them wages and some level of benefits. Large companies usually require that IT staffing firms hire all workers as W-2 in order to protect themselves from the legal and liability risks of independent contractors. If you are a client or employee working with an IT staffing firm that pays workers on 1099 basis to their Social Security numbers, you should seriously consider finding a more reputable IT staffing provider. Note: Employment law is a complicated topic, and we have only scratched the surface. This article is general information and not legal advice. If you would like to learn more, we recommend referring to the information found on the IRS website, your state’s Department of Labor, or talking with a lawyer.